Jute is mainly a production of Bangladesh and Indian state of West Bengal- a primary reason why major jute bags manufacturers are located in this region. Earlier the Jute was used for domestic consumption by the villagers. At that time Jute was largely traded by Dutch and French from Bengal. However, the East India Company took over this trade and shipped them to the United Kingdom. A New hope with the jute traders was felt at the time of Industrial revolution and at the time revolution took placed it was spread all over the Western Europe. Due to the presence of natural fertile soil, Bangladesh is the major Jute producing country. Earlier, raw jute was exported to British East India Company from Bengal. Many people from across the world immigrated to Bengal to set up Jute factories. Jute started to grow in all the sectors such as fishing, construction, art, and arms industry. Moreover, we use jute for many purposes such as Hessian Cloth, packaging materials, burlap, environmental shopping bags, Carpets, and Rugs etc. The remaining other jute products also include decorative fabrics, twine, ropes, yarn etc. Dutch and French were the first Jute Traders in the seventeenth and eighteenth century. In the mid of nineteenth century, United Kingdom took the first step towards Jute industry and it started trading raw Jute with United states, Europe, and other countries. Bangladesh is the largest country to trade and export raw jute all over the world. In order to control the Jute mills, Government of Bangladesh built up Bangladesh Jute Mills Corporation (BJMC). Henceforth, BJMC is the largest state-owned organization, competing in manufacturing and exporting. Kolkata-based Jute Corporation of India was set up by the Government of India to assist the cultivators of Jute and to provide minimum price support. 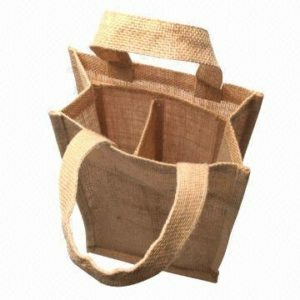 Along with the Jute trade in India, jute bag manufacturers started to export a lot of Environmental Jute Shopping Bags. It had a huge demand because it was the only reusable bag material. A jute bag can be reused several numbers of times and also keeps the environment clean.